Photographers who work in a studio, or on location, shoot tethered with Lightroom and their cameras. 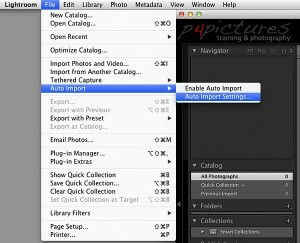 Lightroom includes a feature to shoot tethered with Lightroom. It only works for some cameras and they have to connect with a USB cable. Several EOS cameras feature WiFi to connect to smaprtphones, tablets and computers. Other EOS cameras use a Wireless File Transmitter accessory to shoot tethered with WiFi. Canon EOS cameras with WiFi connect to Canon’s EOS Utility software. EOS Utility connects with EOS cameras using a USB or WiFi connection. These articles explain how to connect your EOS camera with WiFi so that you can shoot tethered to Lightroom. EOS Utility is on the Canon software disk supplied with each EOS camera. 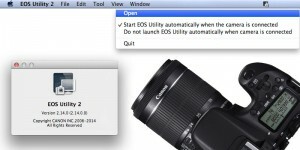 You can download a copy of the latest EOS Utility or a complete EOS software disk from Canon’s website. EOS Utility starts up automatically when a camera is connected with USB and a correctly paired WiFi configuration. 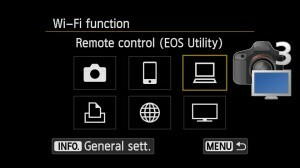 You can speed up tethered shooting by setting EOS Utility to automatically start the Camera settings / remote shooting function. Lightroom needs to be setup to transfer images from the folder that EOS Utility puts them in to.